We received our Friso Experiences Play Set from Friso fro review recently, but only started fixing it up like 2 days later when I finally had the time. It's amazing how time slips by you when you need to cater to the whims and fancies of 4 young kiddos. Every night when I finally lay down on the bed, would already be the time Cinderella needs to get back home and that's at its earliest! Anyway the two older ones were super excited when I started to open up the package and take out the colourful pieces of plywood one by one. Steffi and Leroy were super enthusiastic over it and would not hesitate a second doing what I ask them to do, such as throwing the bubble wrap away or fetching the screwdriver. After I laid the pieces onto the floor, I realized that there were actually no instructions on how to fix it up! I fumbled for quite a while before I finally relied on a photo of the boat online and followed roughly. But no worries for the rest of you out there, because once you start going with the first right pieces, the rest will just connect naturally. Quite simple after that. 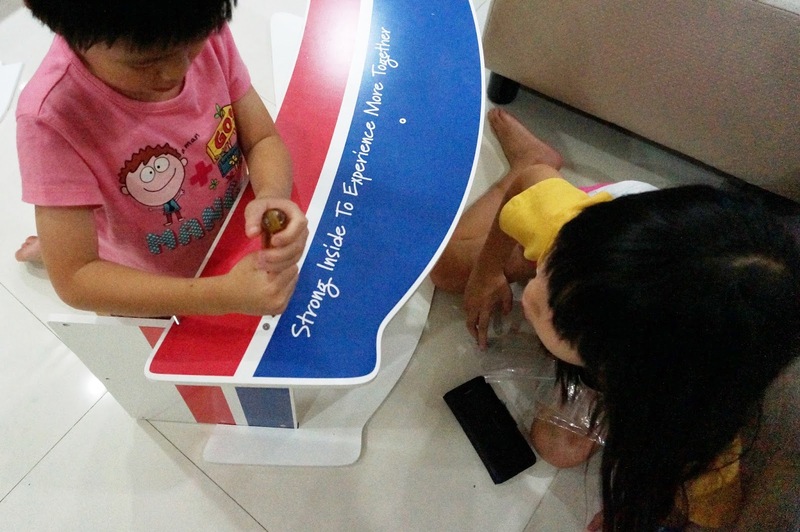 I had the help of Leroy and Steffi who steadied the pieces while I screwed and they both had a go at trying their hands with the screwdriver. 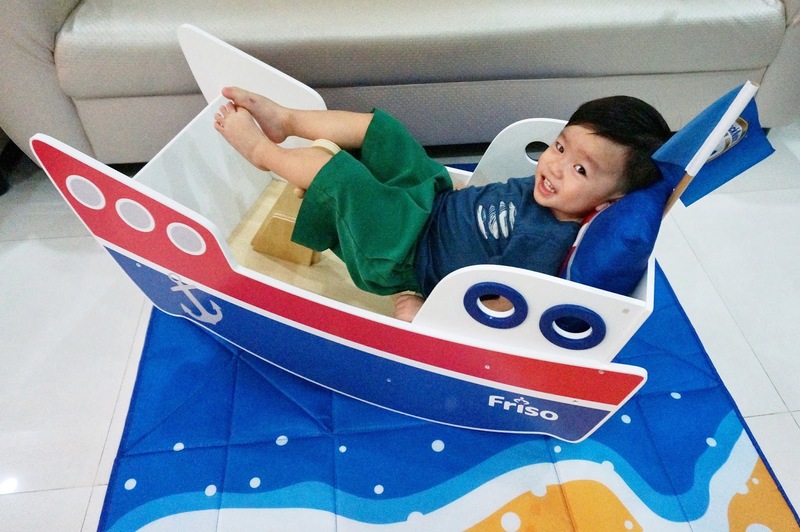 Its great to know that with Friso, the kiddos are growing up strong and can help me out with so many tasks these days. Seems like the hands on fun started even before the boat took shape! It was somewhat like LEGO fixing, albeit on a bigger scale and it gave us real satisfaction when it was finally done. Well after fixing the boat, the two older ones tried it for a while but lost interest soon after, leaving Louie the lucky little one to have the entire boat to himself. He got comfortable rocking back and forth while watching his favourite cartoons. Any more comfortable, he would have fallen asleep in it! 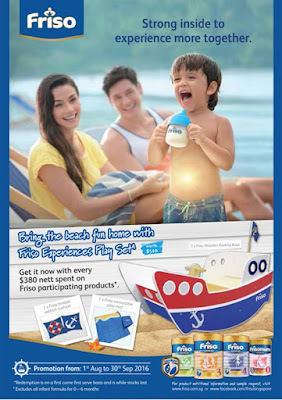 So there you have it, the older kids will enjoy fixing the boat up (with adult supervision of course) but the finished product will be more interesting to the younger ones. The only tool needed is a screwdriver. But hor, with multiple kiddos in the house, I had to warn the older ones of the danger of getting their toes crushed by the incessant and reckless rocking of the boat by Louie! 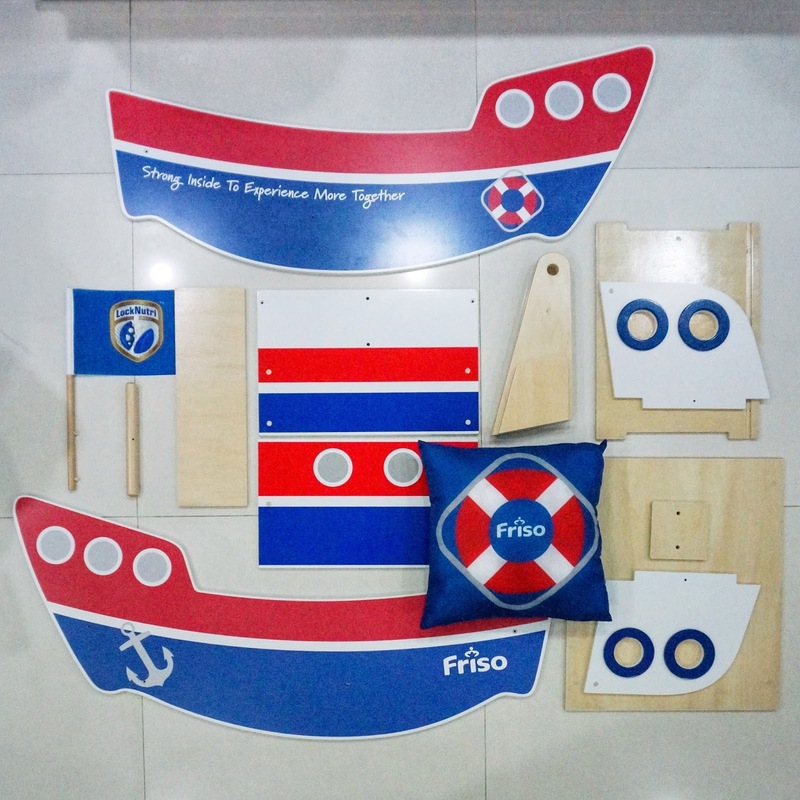 From now till 30th Sept 2016, spend $380 on Friso participating products at FairPrice, Cold Storage, Giant, Guardian, Jasons, Market Place, Prime Supermarket, Sheng Siong, Watsons, RedMart or Beautiful.Me to get this Friso Experiences Play Set (inlcudes a limited edition Friso wooden rocking boat, a Friso Cushion and a convertible play mat) worth $368! Do check out here for more information!